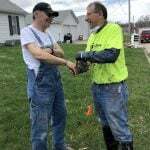 Recently, GoServ Global responded to a couple of natural disasters here in Iowa. One was a flood in Des Moines and the other a tornado in Marshalltown. We offer all of our disaster relief services at no charge. We are currently in need of more funds to continue to help needy families. These funds go to pay for fuel, building materials and other supplies to help people get back on their feet. You can donate right now by going to our website page at https://goservglobal.org/give/and selecting “Domestic Disaster Relief” from the drop down box. Thanks for helping out. We are also launching a fundraising drive by selling boxes of peaches from Colorado. Many of you might remember participating in this fundraiser last year and know how tasty these peaches are. 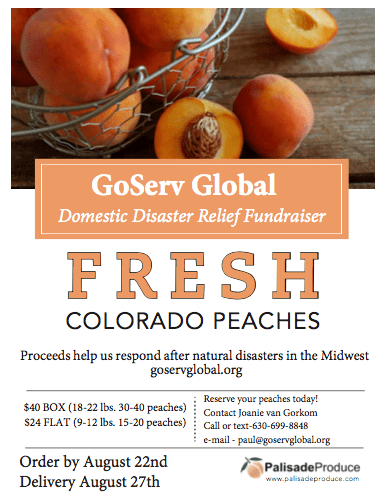 Check out the flyer below to see how you can order some of these delicious peaches and help people who have been victims of natural disasters at the same time. Must order by August 22nd for delivery on August 27th. 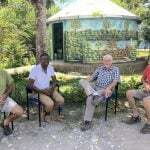 GoServ Global shares God’s love by responding to disaster, empowering sustainable community development and creating world change through hands-on involvement. Write your email into below and we will reach out to you!